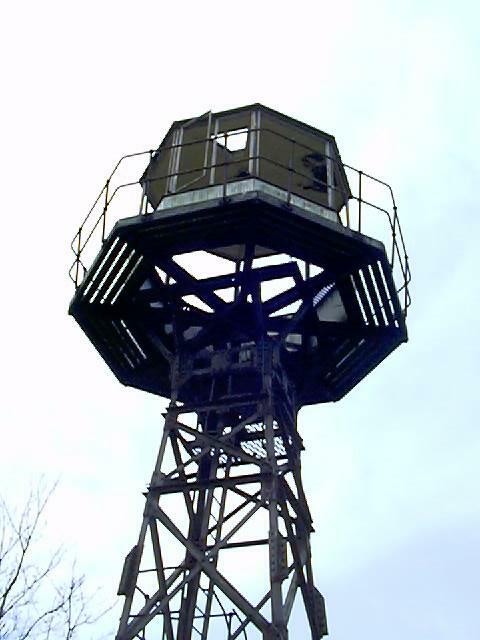 A View from one of the watch Towers showing the outer chain link fence and the inner concrete sectional wall. 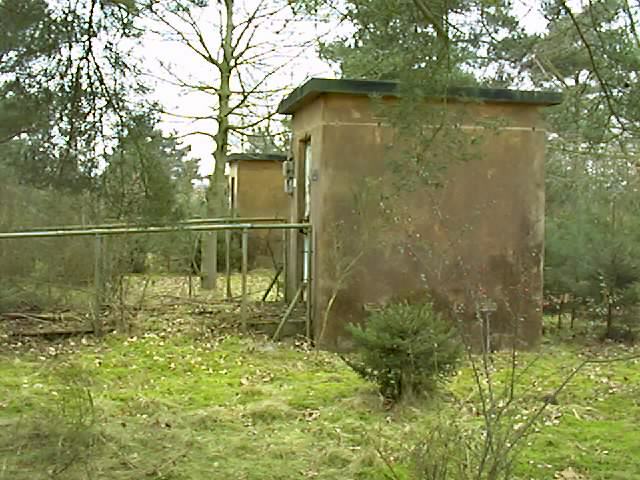 The Fissile cores were stored in small buildings (above & Below) arranged around the large non nuclear component stores. In total there are fifty five of these buildings. which are divided into two types type A containing one storage container and the larger type B containing two. Unfortunately the stainless steel containers have been removed leaving only the holes. The doors to the stores are made of wood covered in steel and secured with a combination lock. 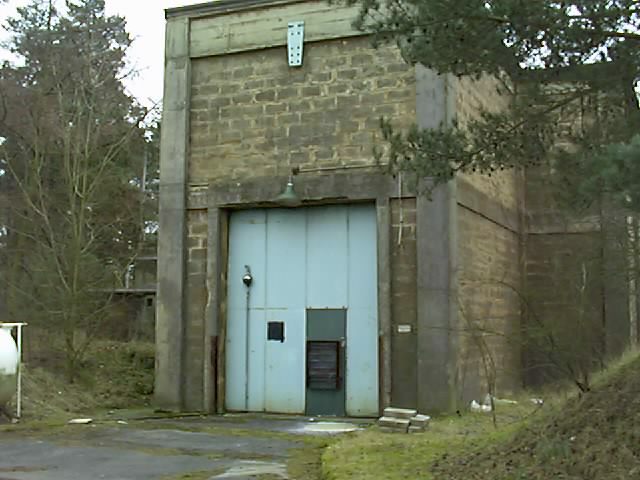 The door has a large spring loaded electrical door contact, this sent a signal to the control building to indicate if the door was open or closed. In total on the site there is enough capacity to store 64 fissile cores. 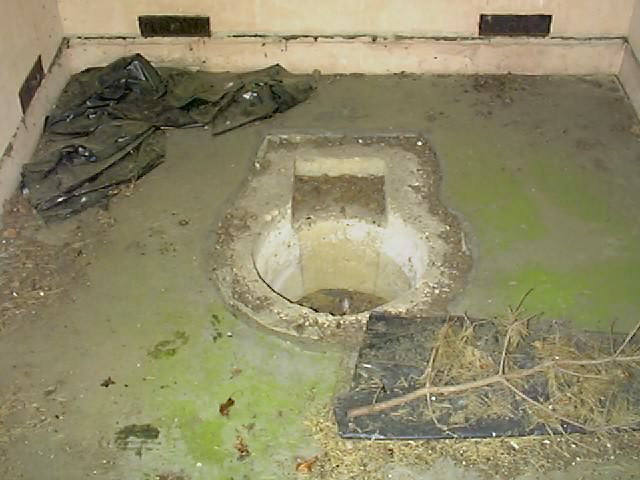 The single hole stores contained plutonium cores and the double hole stores contained cobalt cores. Given the number of available nuclear warheads in the late 1950’s and early 1960’s, it is unlikely that the Barnham store was ever full. Part of Barnham's function was to convince the Soviet Union that Britain had more weapons at her disposal than was in fact the case. The Function of the Non Nuclear component stores (left) was to hold the High explosive part of the bomb and its outer casing. 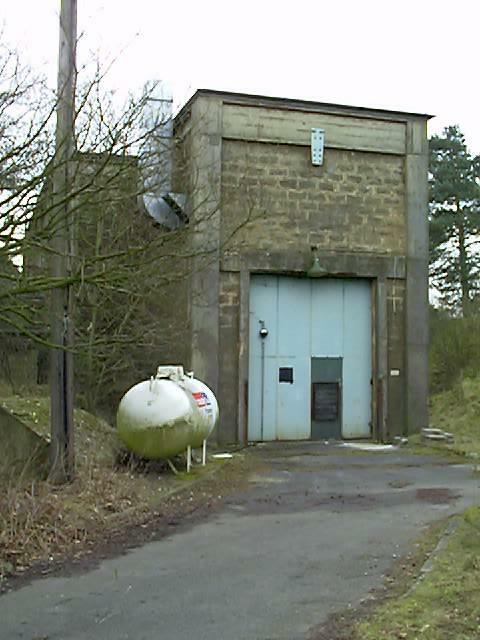 The bombs minus there fissile components were housed in three almost identical buildings These are arranged in an arrowhead formation they are accessed by the internal loop road and are surrounded by 4.5m high earth traverses, revetted by a reinforced concrete retaining wall. the western store was gutted by a fire during the 1980’s and has been demolished. The two remaining store buildings are rectangular in plan and are constructed from reinforced concrete columns and beams. Internally the stores are divided into 11 longitudinal bays and cross ways into three bays. abutting on to the front of the stores, and flanking the entrances are plant and switch rooms, which originally contained heating and air conditioning plant to maintain a stable environment within the stores. Entry to the stores is via a 3.0m wide by 3.5m high door. The First nuclear weapon the store held was the relatively large Blue Danube bomb it measured 7.3m in length and weighed 10,000lbs the problems in handling such a large weapon are reflected in the provision of large lifting gantries at the entrance to each store and projecting out over the road way. Internally there is no lifting beam so it is presumed that the bomb were lifted of a road transporter and loaded onto a bomb trolley for storage. 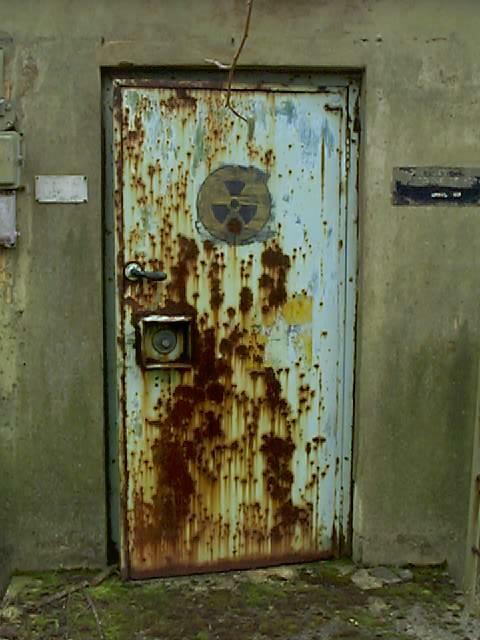 In addition to the storage of nuclear weapons RAF Barnham was also responsible with the deep maintenance and refurbishment of weapons rotated from airfield stores Amongst the buildings a number may be identified where components, or hole bombs could be brought for stripping and testing. The precise activities carried out in these buildings will not be known until, if and when, the servicing manuals for Blue Danube are declassified. 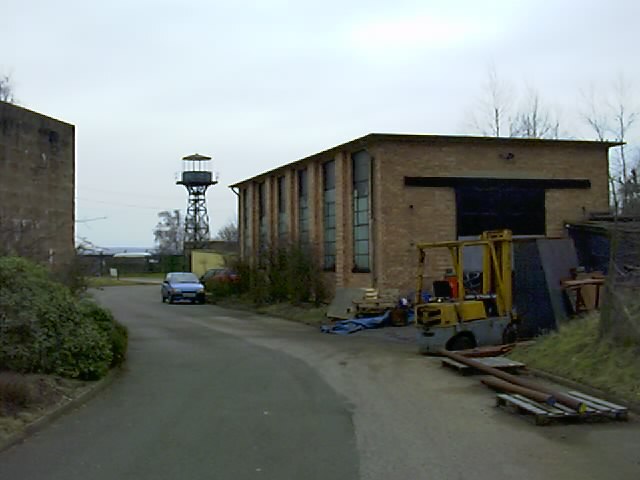 The Building on the right hand picture is one of the maintenance buildings. 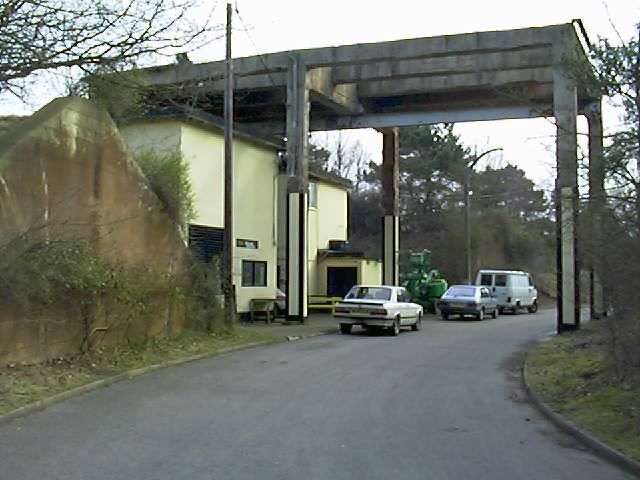 RAF Barnham is close to the Town of Thetford in Suffolk it is located on Thetford Heath which has been used by the MOD since the early years of the Second World War. 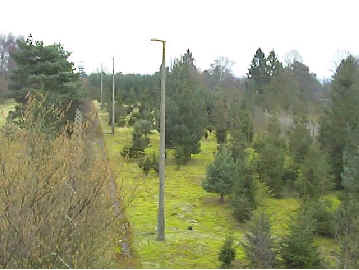 The land near RAF Barnham is still used by the MOD as a troop training area. 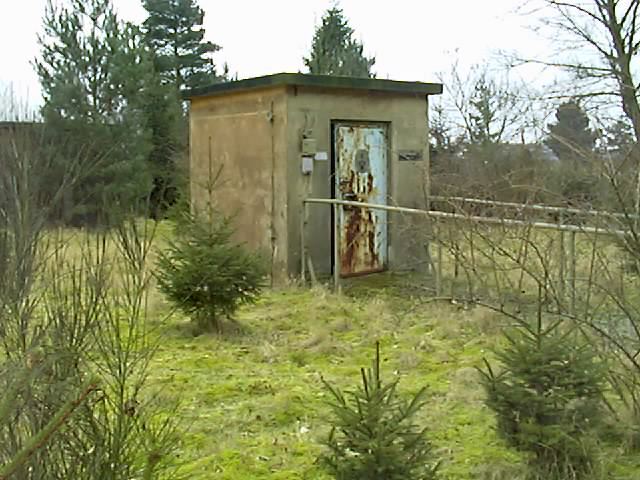 estate, please obtain permission before entering any buildings on the site.